Even though I played soccer as a kid, I grew up watching mostly professional baseball. Even though I did catch Pele play a few matches for the NY Cosmos as a kid, my love for professional soccer started when the US hosted the 1994 World Cup. My professional speaking career, however, seems to be linked to professional soccer. It all started at my very first TechEd: TechEd Europe 1998 in Nice, France. Prior to 2006, TechEd Europe was held in early summer, always causing me to spend the July 4th independence day outside of the United States. Back in 1998, France was hosting the World Cup and subsequently won it all. While I got caught up in all of the hoopla, I also had to speak at an event in London the next week and the entire country of France shut down, making it impossible for me to travel. Thus began the link with my professional speaking and soccer. As the years went by I found myself speaking in Barcelona six times and went to FC Barcelona matches each year and they became my favorite team. in 2005 I found myself in Turkey when the European Cup was going on (and had to deal with the traffic since the speaking venue was right near the stadium). In 2006 I found myself in Egypt during the Africa Cup and was in a taxi trying to get to my speaking event in standstill traffic as the entire city tried to obtain tickets for the final match. I had to get out of the taxi and run 3km to the venue to make my talk in time. (I called Patrick Hynds to stall the crowd, but did make it with 5 minutes to spare.) I watched Egypt win the finals on penalty kicks a few days later in the middle of the street in Luxor with about 20 locals surrounding a tiny black and white TV while Kathleen shopped. We all smoked shisha together to celebrate and the shop owner (who was ignoring Kathleen and watching the game) gave us an additional 50% discount on all sales. After Kathleen finished buying her stuff, all of us, including Goksin’s 7 year old daughter, started running through the streets to celebrate. One of the most memorable experiences was also in Egypt. in 2004 FIFA stated that Egypt, Morocco, and South Africa were the favorites to host the 2010 World Cup. I was in Egypt and Morocco during that time and met up with several MVPs for dinner. They all asked me: “Do you support an African World Cup?” I said yes and said that I will travel back to Africa to watch the world cup in 2010. 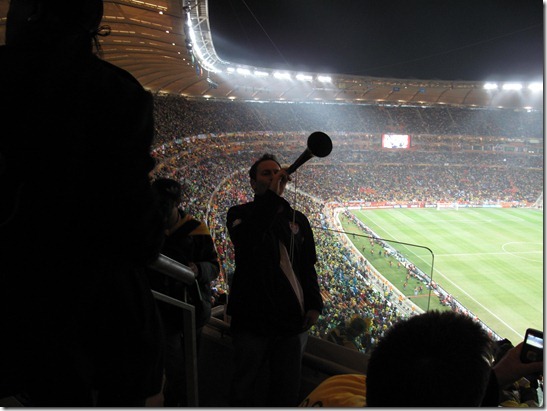 Most of the non-African world hates the vuvuzela horn. The vuvuzela is an uniquely African (mostly South African) cultural experience. You can’t enjoy soccer in southern Africa without it. Showing my support for the African World Cup, I went native and blew that horn all night long. I am glad that I was able to keep my 6 year old promise. It seems that professional soccer and my speaking career are linked. Any Brazilian MVPs/RDs want to put me up in 2014? Ok that is approximately 813 times. But when I was a kid Shea would open up to the public in the winter and you could go sleigh riding and cross country skiing for free. I would often go with my dad or best friend Billy. As an adult I would also run the NY Road Runners "Run to Home Plate" (with the Tank) 5K run. So Let's say 850. I round up, 1,000 sounds better. The Mets lost 8-3 last night. It was an ok game, the game was fast paced and the Mets did not give up, making it interesting in the bottom of the 8th inning. I kept telling stories of vending, going to games in 1986, what sections I worked during the Rolling Stones concerts. Shea holds many memories for me like watching the Jets with my Dad and watching the Mets with my late Grandfather. It was also the venue of my first job, a job that made me rebel against "normal" jobs and lead to a life of enterpreunship. I witnessed some amazing playoff games in 1986, 1988, 1999, 2000, and 2006. Even saw some great Jet games (some great come from behind games with Richard Todd!). I always go between Game 6 and the 1980 US Hockey game vs USSR as the best sporting event of my life.Game 6 is forever part of my life and Endy's catch in 2006 (the other (bad) Game 6) is something I will tell my grandchildren about. As a lifelong Mets fan, I have wanted to tear the place down since about 1992, once the new stadiums started going up. I got my dream a few years ago with the agreement to build CitiField.The new place looks great, it will make a great home for the Mets. I can't wait to go to a few games there. At 9:54 pm, I looked at my cell phone for the time, paused, and then walked over the threshold at Gate C, exiting the stadium for my very last time. Kathleen just rolled her eyes, but a huge chapter of my life just closed. So long and thanks for the memories. We'll miss you William A. Shea Municipal Stadium. I know this is a technology blog (sort of). But those of you who know me, know that I have an unhealthy obsession with the New York Mets. Why would I say I would visit Yankee Stadium, the home of the enemy? 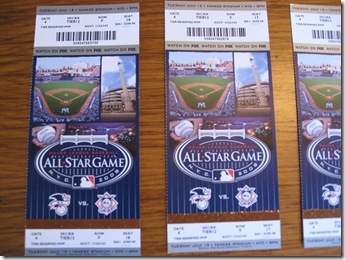 By the magic of stubhub, I bought four tickets. They arrived today. The game is on Tuesday, no rain in the forecast. So I lost to Lance Armstrong in the NYC Marathon yesterday. Oh well. I am now in route to TechEd in Barcelona! Is a sports blog and podcast and is located here. I hate the media. I hate the French. First Ivan Basso and Jan Ullrich. Now Floyd Landis. Let's not jump the gun and have a trial in the media. Let Floyd enjoy his victory until there is conclusive evidence against him. What makes Floyd’s win so special is that three years ago he took a massive fall and hurt his hip pretty bad-so bad he needs hip replacement surgery this fall. So the tour was a great comeback for Floyd. The USA appeared flat it its first game today. CHZ was faster and played better. We're down, but not out. The World Cup .NET is Here! The World Cup is finally here! Hopefully Team USA does as good as 2002. You need to install the Microsoft Football/Soccer Scoreboard here. It is a great little tool to keep track of the matches. All my friends are excited about the Mets' great start this year, bringing up memories of 1986. We'll see how the 2006 season plays out but this guy in San Diego has way too much time on his hands. He has recreated the most dramatic event in sports history, the bottom of the 10th in Game 6, in RBI Baseball and synced up the announcers. Watch it here. Starts in 3 days. It will be great to see Lance in his prime go out in style. Win or lose it will be quite an amazing tour. I was a competitive swimmer and cyclist growing up. I was even captain of my High School swim team. I have also been doing triathlons since then. (Unfortunately I have to sit out of a tri this weekend due to an injury) So every 4 years I am glued to the TV to watch the cycling, swimming (and diving, I dove too), and track and field events. And of course whatever women was in my life (from moms, to wifes to girlfriends) at the time made me watch the gymnastics. Tonight (2:30 EDT) in <?xml:namespace prefix = st1 ns = "urn:schemas-microsoft-com:office:smarttags" />Athens is the match up of the entire Olympics. Ian Thorpe (21) of Australia and Michael Phelps (19) of Baltimore, MD. These two kids can swim. They have lots of world records and 2004 Olympic medals already. (They are trying to catch Mark Spitz from 1972 with 7 gold’s, highly unlikely-nobody can catch mark). What I am sad to think of is that each of these kids will go home with several medals (they each have a gold already I think) and if they “only” get 4 or 5 medals people in the media, etc, will say it is a disappointment. Screw them and their internet “what have you done for me lately” reality TV-obsessed, recall vote culture. Tune in tonight (8pm EDT tape delay in the US) and watch some great competition! Lance is back in Yellow. One of my childhood heros has fallen to a new low and is not only no longer a hero of mine but I would punch him in the face next time I see him. Last time I saw him we did shots together, next time, you will be taking shots. from me. In an interview with French daily Le Monde, Greg LeMond -- winner of the Tour de France in 1986, 1989 and 1990 said Cycling is doped and so is Lance Armstrong. He accused Lance of being a liar and a cheater, even though Lance has been cleared over and over again. Even though I have loyalty to Greg and my best friend growing up, Bill, is currently captain of Greg’s pro racing team, I have to say Greg you have now crossed the line. Greg has never like Lance Armstrong. Maybe because when Lance (pre-cancer) started racing in 1994 he said “I am not the next Greg LeMond, I am the next Lance Armstrong.” Or maybe Lance’s victories have made Greg seem like an also-ran. Whatever it is, you must stop now Greg. Lance is a true hero and an inspiration to us all. You are a washed up athlete shooting off your mouth. Other sports sell ads. Ever watch the World Cup? The Olympics? Or my beloved hockey, where the NHL allows the stadiums (with names like Pepsi Arena) to sell ads under the ice. Or what about the Baseball teams in Japan, named after corporate sponsors. Let’s face it, we live in a world ruled by advertising and corporate sponsorship. Just deal. Critics of the game should be more concerned with all the players on Steroids. I am officially boycotting the US Postal Service after they dropped their sponsorship of Lance Armstrong. Like 5 tours is not enough? I am sure that someone will pony up the money for the greatest team in pro cycling. Just a few days ago Lance won the Tour of Georgia, a 1,000 km stage race. Next stop, a 6th Tour de France victory in July. That is what I said to the ticket salesman last night at Shea Stadium as I bought a $5 ticket to the Mets v Expos game. Cheaper than a movie, Linda, Sara and I entered with high expectations. After a $6.50 beer, $2.50 hotdog and $3 popcorn, the Mets did get their money. The game was fun, pitching was good, but the Mets came up short 2-1. We had to shout French curses at the Montreal Expos, it was a hoot. The Mets won their first game of the year last night, defeating the evil Atlanta Braves. Rookie Kaz Matsui from Japan hit a home run in the first pitch he saw in the Majors, and went 3 for 3, go Japan power!